The DREAMer movement is in flux. 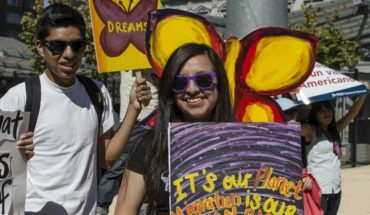 Once monolithic, political activism by young, undocumented immigrants has become fragmented, with some activists abandoning the fight for comprehensive immigration reform, and others focused on local efforts to support undocumented immigrants. Many have stopped calling themselves DREAMers. 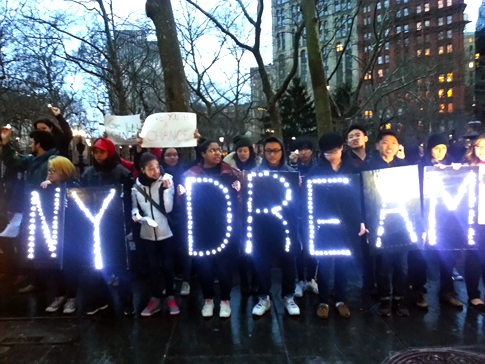 In New York, where an estimated 90,000 youth would be eligible for relief under the DREAM Act, some young activists are turning to increasingly radical forms of protest. But some, meanwhile, continue to work within the political system to push for a pathway to citizenship for undocumented immigrants. Read Von Diaz’s story – The DREAM Movement’s New Agenda: Five Young Immigrants Tell Us Why They’ve Moved Beyond Seeking a Pathway to Citizenship. In this podcast Fi2W executive producer John Rudolph and former editor Von Diaz talk with Thanu Yakupitiyage, the Communications Coordinator for The New York Immigration Coalition (NYIC) who runs a group for undocumented youth in New York. Listen to their conversation about why many undocumented youth are shifting focus, and what it could mean for the movement. Fi2W is supported by the David and Katherine Moore Family Foundation and the Ralph E. Odgen Foundation. The Fi2W Magazine was made possible in part by The Media Consortium and the Voqal Fund. Fi2W podcasts are produced with the support of the CUNY Graduate School of Journalism and CUNY TV.